Last week, I performed an in-depth analysis of our five best goal scoring chances against West Ham United which produced four goals and a point blank save from Fabianski to deny Salah a 2nd goal. This was largely achieved by using West Ham’s man-oriented zonal marking against them in the end. I mentioned last week that the aim of the attacking team, in the simplest of forms, is to create space > attack that space > create & score goals. The defending team’s aims, in the simplest forms, is to restrict space and/or time on the ball. Let me demonstrate what I mean by this. With man-oriented zonal marking, West Ham were trying to maintain their team shape while also marking the players as they enter their zones. The aim here is to restrict time on the ball to prevent the opposition exploiting the space that will open up when defending in such a way. They try to somewhat compress this space by playing a higher line. Naturally, that gives your opponent space behind your defence instead. So this was their trade off: they would give us space in behind, accepted space may open up elsewhere in front of the defence but believed by restricting time on the ball, they could prevent us using that space. There is some logic to this game plan also. Do you remember the Europa League final? The 3-3 draw in Sevilla? Maybe the Champions League final? These are all games where our defence and midfield were given little time on the ball, struggled to complete passes, we gave up possession in our own half and our attack became disconnected from the rest of the team. However, the first problem West Ham had was that coaching this type of system takes practice. Typically, until then, players will press out at the wrong time on the wrong player which just leaves space and an opponent free somewhere you don’t want them to be. This was an issue Klopp’s system always had with Emre Can. For a good example, find the equalizing goal in the 2-2 Sevilla draw and watch the chain reaction that occurs the moment Emre Can decides to charge after the ball alone into the Sevilla half. Getting back to West Ham, their problems arose when Liverpool created overloads in midfield – typically through Firmino dropping into the midfield – which often resulted in Milner, Gini & Firmino occupying their three midfielders. West Ham were never sure when to fully engage, fully push up their line and how to deal with Liverpool having a free man in Alisson with the ball. Knowing this, Gini & Firmino would continue to pull West Ham’s midfield up the pitch, Milner would pull them wider, all creating space in front of the Palace defence for Naby Keita to attack unmarked with all the time and space a player of his quality could ever wish for to tear a team to pieces. Movement of West Ham players out of their shape in the build-up to Liverpool’s opening goal. With Arnautović closing down Alisson so high up the pitch, West Ham felt the need to push up on Liverpool’s defence but had the problem of Liverpool having an overload around the ball leaving Gomez, then Trent free. They had Robertson free as Antonio pushed up on Virgil. They also had Keita free as Noble gets drawn up the pitch to mark Firmino. With Gini dragging Wilshire further and further from the ball, West Ham ultimately never restrict Liverpool’s time on the ball adequately while giving them space in front and behind their defence. Thus needing to retreat knowing Keita can pick them off with balls into Mané or Salah to run onto behind their defence. However, Roy Hodgson’s Palace would not take such risks. They have almost no interest in interrupting our build up and consolidation phases except maybe in their transition to defence. Their sole interest is in preventing penetration and finishing. Therefore, what we faced is what we typically call a low-block or, as the internet calls it, parking the bus. As you can see here, this is a 4-4-2 formation setup in a low-block – by which I mean they are compressing their shape to remain in their own third of the pitch and only engaging the opponent when they enter that area of the pitch also. In doing so, there is plenty of space and time on the ball, but only in areas where you can do very little to hurt them some 35 yards+ from goal. There are some spaces on the flanks, which means encouraging the opponent to play passes over their team shape into the corners. Balls that favour their tall full backs to head away or to go out harmlessly for goal-kicks and throw-ins unless perfect from both the deliverer and receiver of the passes. However, inside the Palace team shape marked above, you get neither time nor space on the ball, restricting both things the attacking team are trying to gain in dangerous areas. 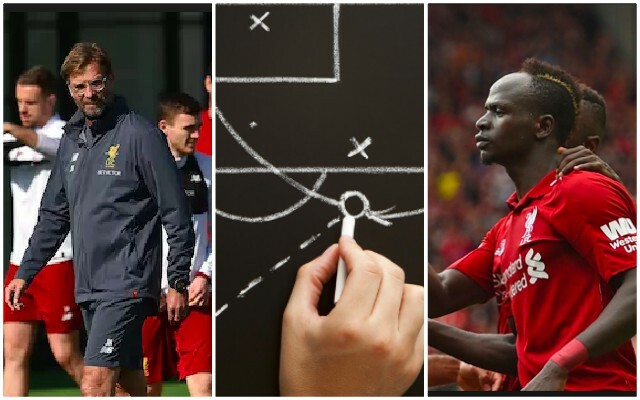 So how did Liverpool set about the task of creating big scoring chances against a system designed to prevent any space or time in the most valuable goal-scoring locations? Liverpool created their first big chance of the game catching Palace before they could properly transition into their defensive shape. Keita showing outrageous press resistance deep in his own half and setting Salah away with a wonderful chipped through ball that would have been one of the great all time assists had it come off. 21’54 Trent Alexander-Arnold shows excellent awareness and starts an early recovery run to cover in behind Gomez getting to a through-ball intended for Zaha. He plays a first time pass back to Alisson. Keita immediately starts making an angle to receive the pass by drifting towards our left flank. Virgil scans the pitch, notices this and signals it to Alisson also. Keita quickly checks over both shoulders to see what is behind him and if he is being closed down. 21’58 Alisson, under pressure from Zaha, plays the ball out to Keita in our left half-space edge of box. 22’00 Keita uses his low centre of gravity to drop his hips, flick the ball from the outside foot behind the inside one, shift his weight and turn his opponent in one move to leave Townsend chasing a ghost. 22’04 Keita carries the ball up the pitch now unopposed. Salah makes a run off the back of Sakho as the Palace backline retreats. Palace needed pressure on the ball here as they exposed with space both in front and behind the backline. Keita chips a through ball perfectly into the path of Salah. 22’08 Salah’s first touch brings the ball back towards him rather than putting it a half-stride in front of him making the finish a lot more complicated. It also slows his forward momentum allowing Sakho to get back close enough to make a challenge should he try to round the keeper or take another touch. The lob is now his best option which he tries, but it sails over the bar. A little unlucky here. Had the ball fallen how Salah would have ideally wanted it, Hennessey was pretty stationary outside his goal when he took his first touch. Salah would have had all the advantage to go round on his favoured left foot and Hennessey wouldn’t have got near him from a standing start. Unfortunately his first touch brought the ball back towards him losing him that forward momentum and allowing Sakho to get into a position to possibly make a challenge. Liverpool’s second big chance of the game is perhaps a better example of the sort of chance you create against a low-block. Vision & technique from Firmino, dribbling to commit players, the long shot threat to drag defenders out towards the ball leaving space in the box for others. 26’13 Trent Alexander-Arnold restarts play with a throw-in to Gomez. 26’15 Gomez passes the ball to Milner. 26’16 Milner takes a touch and passes to Virgil. 26’17 Virgil also takes a touch and passes to Robertson. As mentioned in the previous article, we are now in the consolidation phase. Here we will largely avoid taking risks until the opportunity exists to create or exploit space, then the tempo increases once more. Given how narrow Palace’s block is, we are trying to move them side to side with quick one or two touch passing. As players are all individual and move at different paces and often unaware of what is behind them as they track the ball, naturally some gaps can appear. If you watch here, two of Palace’s midfielders fall too deep close to their centre halves and this creates a little hole in the formation for us to use as Milivojevic follows Keita. 26’25 Robertson receives, holds the ball and then passes to Milner in the space left in front of the Palace midfield. Keita has spun in behind Townsend. Neither Townsend nor Milivojevic notice that he is now unmarked. 26’27 McCarthy presses out fast realising that Milner has too much space and time on the ball. He leaves something on Milner as he passes to Gomez. At this point with Milivojevic having tracked Keita up the pitch and towards the ball when it was on our left, Townsend pushing up on Robertson and McCarthy rushing out to close down Milner, a clear hole has appeared now in front of the Palace defence. Firmino will step into it. Milivojevic then moves across to mark him. Trent has maintained good width right and suddenly Palace’s shape is looking a little stretched from having moved from one side of the pitch to the other and back again in a half dozen passes. Gini is now moving towards Gomez on the ball to try and drag Schlupp up the pitch also. Mané is moving inside behind Tomkins and dragging Wan-Bissaka infield away from Keita who is still unmarked. 26’29 Gomez plays an excellent pass with pace into Trent. This forces Schlupp to have to move quickly out towards him. Again, this creates a space now in the right half space which Firmino drifts into Salah also comes short towards this area too. 26’33 Trent Alexander-Arnold quickly plays the pass into the space Firmino is attacking. 26’35 Firmino gets to the ball in front of both McCarthy & Milivojevic and flicks it into the feet off Salah just outside the box. They have now eliminated Palace’s midfield from the game. 26’36 Salah dribbles across the front of the box taking Sakho & Tomkins out of the game and manages to make enough space to have a shot. Salah’s shot hits Mané and breaks to Keita. 26’40 Keita shoots first time on his weaker foot. The shot is saved by Hennessey who is well positioned here to make the save. Again, fine margins here. Salah perhaps shouldn’t shoot when he does, he should be playing in Keita or trying the more difficult through ball for Mané similar to the one Firmino played him in with against West Ham to setup Mané’s second. But this is what goal-scorers do, they take on a lot of shots. I did like how we quickly moved the ball across the pitch in the consolidation phase all-the-while using movement to create a free-man in their box and space in front of their defence. It highlights the importance of our full backs to stay high and wide against a low-block. Once again, both Gini and Firmino seem to have an excellent ability for creating space whereas Keita is excellent at attacking it. I can see this being a combination that will consistently hurt sides this season and it’s only a matter of time before Keita finding this time and space in dangerous positions results in him getting amongst the goals & assists also. You’ll be pleased to know that I’m not going to talk you through someone scoring a penalty. I would just like to look quickly at exactly how the penalty comes about though. 43’24 Gini gets tight to Benteke as he controls a pass to prevent him turning. Robertson quickly joins him to box Benteke in and between them they regain possession. 43’26 van Dijk passes to Wijnaldum who quickly spreads the ball wide to Trent on the right. Firmino starts a move towards the right flank which sees both McCarthy and Milivojevic move towards him. Schlupp steps up to prevent Trent carrying the ball further. Keita is moving towards the centre of the pitch dragging Townsend inside with him leaving Robertson unmarked in a lot of space. Aanholt also starts stepping up towards Firmino as Palace lose their shape. Gini moves into the space Milivojevic. 43’33 Trent spots Gini ghosting into space to his left in the blind spot of Benteke & Milivojevic and finds him with a nice pass inside. I want to point out two little things here that tends to be something of a glass ceiling for footballers and are among some of the things I am referring to when I talk about the ‘tactical level’ of a player. Scanning and positioning in blind spots. Rewatch this again and just look at Milivojevic’s head from the moment Gini passes the ball to Trent and him receiving it again. Not once does he glance over his shoulder. Likewise Benteke. If you watch top players like Xavi, Messi, Iniesta, Salah, De Bruyne, Modric, Busquets – they will all constantly be looking over their shoulders. Now a really clever player will know that a person’s peripheral vision is 120o which means if you position yourself to their side and a pace or two behind them, they are not going to be aware you are there. Their own team mates assessing the situation will think they are marking them, but essentially you are unmarked as you can receive a pass on the half-turn and be away before the player nearest you is even aware of your existence. This was something I was always hugely critical of in Moreno but, to his credit, he has actually started scanning since his spell out of the side in 2016/17. It is something Can really struggled with also, which is a problem as you will struggle to be an elite central midfielder if you don’t have 360o awareness. Hence why many thought he would fare better as a centre half long term which the game is mostly in front of him and the tactical side of his game, which is his big weakness, wouldn’t be tested as often. So watching Gini here, he makes sure he remains slightly behind Milivojevic’s eye line and behind Benteke. He will never appear as unmarked or a threat there as he is near opposition players but he is ready to receive the ball in a dangerous spot and his opponents are not ready to react to him. 43’33 Gini receives in the pocket of space and spreads play to Robertson on the left. Palace are now getting moved around quickly again which, as noted before, should see space open up somewhere. 43’41 Robertson receives, holds while Palace shuffle across, then plays it back to Gini. Palaces two lines have now almost collapsed into one which leaves space in front of their midfield for Milner to step into. Firmino has also drifted out to the right flank to setup an overload with Trent. 43’43 Gini quickly plays the ball inside to Milner who lines up a long range shot. McCarthy rushes out to charge it down. Ball breaks to Firmino in the right half-space. 43’48 Schlupp and Aanholt both move across to close down Firmino. Salah is backing Sakho away from the ball. With McCarthy pushed out to block the shot, this creates a space between Sakho, Aanholt, Schlupp & Milivojevic. Salah can now pin Sakho and receive the ball in the box. 43’50 Firmino plays the ball between Aanholt & Schlupp to Salah in the box then makes a run to receive the return pass. This forces McCarthy, who was rushing back, to chase Firmino into the half-space rather than try and help Sakho deal with Salah who has no access to the ball. Having backed into Sakho, dropped his hips, and with a lower centre of gravity and superior balance, Sakho now has a problem. He is grappling with Salah instead of giving himself a little space. Not enough to let Salah turn, but maybe an arm’s length, so that Salah cannot just roll him as he did Cahill & Maguire last season. Sakho doesn’t have access to the ball, nor can he likely see it, yet is still trying to toe it away multiple times and in the process, trips him instead. It’s a penalty. 44’52 Milner converts and it’s 1-0 Liverpool. As well as moving teams around with quick passing while also trying to move players out of position, as we saw with the Keita chance, another key part to breaking down these sides is committing defenders. This means you need players who are capable of receiving the ball in tight spaces, riding tackles, shielding the ball, taking players on in the box, etc. Defenders tend to panic in these situations, get drawn towards the ball, stop scanning and thus space will appear. Not to mention that often players will simply foul the man on the ball, as Sakho did here. The more players you have capable of doing so in your side, the more proficient you will tend to be in tackling sides such as Palace. It is therefore no coincidence that Pep looks to load up his sides with full backs, centre midfielders and attackers who are all capable in 1-v-1 situations. In particular, he likes smaller, agile, quick footed ‘needle players’ in as many attacking positions as possible. This is one area where Klopp’s Dortmund side could struggle at times, perhaps why we are now seeing him cater for almost exclusively with attacking signings such as Mané, Salah, Shaqiri, Keita plus the targeting of Fekir as he looks to overcome that obstacle from his past. Liverpool’s second goal of the game was quite typical in these situations. Palace need to make the most of the few chances they would get against Liverpool which means playing for set pieces and pushing men forward when they get them, especially once they went behind in the game. Liverpool go against the conventional wisdom of pundits by bringing their whole team back for corners and free-kicks in deep areas rather than “leaving a man up to keep them honest”. But it actually works to our advantage, as we see here. 92’07 van Dijk heads away Palace’s corner. 92’10 Ball is recovered by Salah just outside the Liverpool box. Mané’s pace has already got him ahead of Meyer. Aanholt moves across to try to delay Salah. Salah plays a through-ball into Mané. 92’15 Mané carries the ball up to the edge of the Palace area as Aanholt chases. Mané cuts across him with the ball to prevent him being able to get back and make a proper challenge. Salah has made an excellent run to support Mané if needed. Meyer has long given up the chase. 92’16 Mané takes the ball around Hennessey and slots into an empty goal. Pretty simple goal to analyse really. The very deep start of our players is crucial here. Either the opposition then push up onto them with their deepest players and risk losing a foot race to a ball in behind them (Mayer v Mané). Or they stand off but risk letting out players get on the ball, turn and run at them (Salah v Aanholt). The additional benefit is that any early through-balls will always be onside as our players will be in their own half. Imagine, if you will, this attack had a higher starting position. Had Mané ran beyond Aanholt who rushed to press Salah, he could end up offside in the Palace half. If the ball is too far ahead of Mané, a good sweeping keeper could cut it out. The key to breaking down sides who will defend low and compact both vertically and horizontally for me is in creating big chances rather than lots of small scoring chances. Sure, you could get lucky with a 40 yard pile driver that goes in. More often than not though, you will end up seeing dozens of shots from distance that don’t threaten the keeper. I like that we were focusing on moving their shape around quickly, trying to commit defenders, exploit little gaps that appeared. Creating three or four big chances per game against such sides will put us in a strong position to put them to the sword in the vast majority of instances rather than relying solely on individual brilliance and wonder goals to break the deadlock. It seems now we have both the system in place to grind these sides down and the players to come up with those special moments when all else fails that can turn a few draws into wins over the course of the season.